Economics AS Lesson Study in action. Initial meeting: Discussion of a possible focus and plan of action. Jon and Manna identified the issue of securing essay outcomes that match the examination criteria more closely following teaching phases and class discussions. It is a common challenge for students to translate their learning into a format that shows their understanding in a way that secures the highest possible mark; often students think they’ve understood the concepts, the analysis, the graphs and case studies but don’t bring it all together effectively in response to a question in timed conditions. We planned a lesson based around the idea of using exemplars from former students and the associated mark schemes to improve students’ understanding of the transition from the mind map to structured essay. My role, a non-specialist, was to focus of the lesson study process, rather than the subject specific issues and I felt this was valuable. I could reflect back to Jon and Manna and contribute to the planning even though I wouldn’t be teaching the lesson myself. Lesson1. Lesson Study Lesson was taught by Jon, observed by me and Manna. Three focus students were observed closely, without their knowledge. Materials were taken away by the class as preparatory homework. Lesson 2. Students did a timed essay based on the previous lesson. Jon marked the essays the same day to assess success ahead of our meeting later that week. Student interviews. Manna discussed the experience with the three students after school and they later sent emails summarising their feedback. Concluding Meeting. We all met for a working lunch to pull together the lesson observations, the essay marks and feedback and the student responses. Set out the question in hand:Discuss the extent to which regulation alone can be used to correct the market failure associated with the sale of fast food. (18 marks) This was a sample market failure question; a different topic would be set for the timed essay. Paired discussion of the question, using prior knowledge of concepts of market failure and regulation. This to be followed by whole Class discussion, facilitated by Jon, pulling ideas together ahead of looking at the mark scheme. Introduction of the mark scheme: Looking at the way the marks are banded and then specified in detail. Jon provided a simplified summary scheme as well as the official exam board scheme. Introduction of the sample scripts. 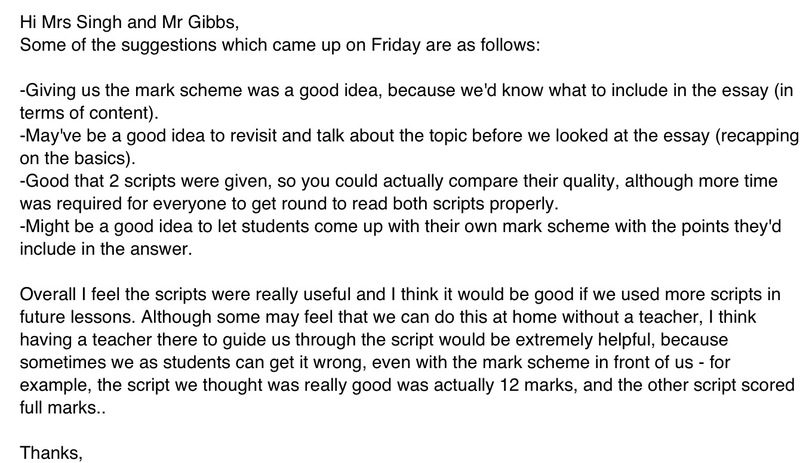 Students asked to use the mark scheme to give each script a mark out of 18 and, at least decide which script was the best. A sample script. There is a lot to take in! How did it go? What did we learn? The discussion went well on the topic. Students gained enough insight to engage with the sample essays and mark scheme. Some detail in the oral discussion is lost – it can be too ephemeral for some students so better recording of ideas that surface in discussion might be needed. They didn’t really have enough time to mark the essays thoroughly; time pressure was a problem. When asked to give their scores, most students got it wrong! They inverted the rank order. Largely this was because of confusion over whether more ideas would improve the essay or whether it was better to develop each idea further – the latter gaining more credit. Recognising the value of this deep but narrow approach is another area to work on – as they tend to spread themselves thinly with too many variables less well explained. In terms of the follow-up essay writing (which focused on chewing gum, not fast food), students scored a range between 10 and 17 out of 18 which is a positive start. Most were around 13/18. Getting beyond this level is a barrier to work on. There is a baseline for future assessments. 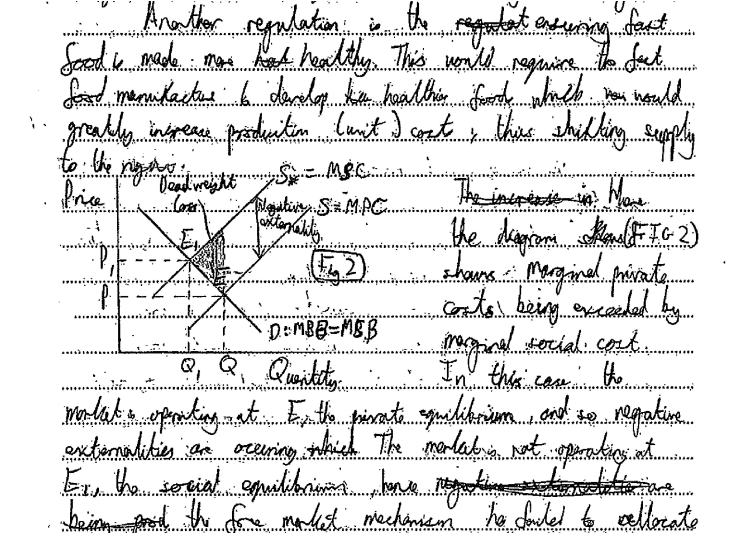 Students were asked to briefly mark their own essays before Jon marked them and the level of accuracy, based on the scheme, was high. This was encouraging in terms of their improved confidence with applying the mark scheme, albeit to their own essays. The best answers were those that secured good responses to the ‘the extent to which’ component. It’s an area to highlight in the future – pros and cons, plus an overall evaluation and discussion. Student email giving feedback on the process. The idea is useful and valued but needs more time. 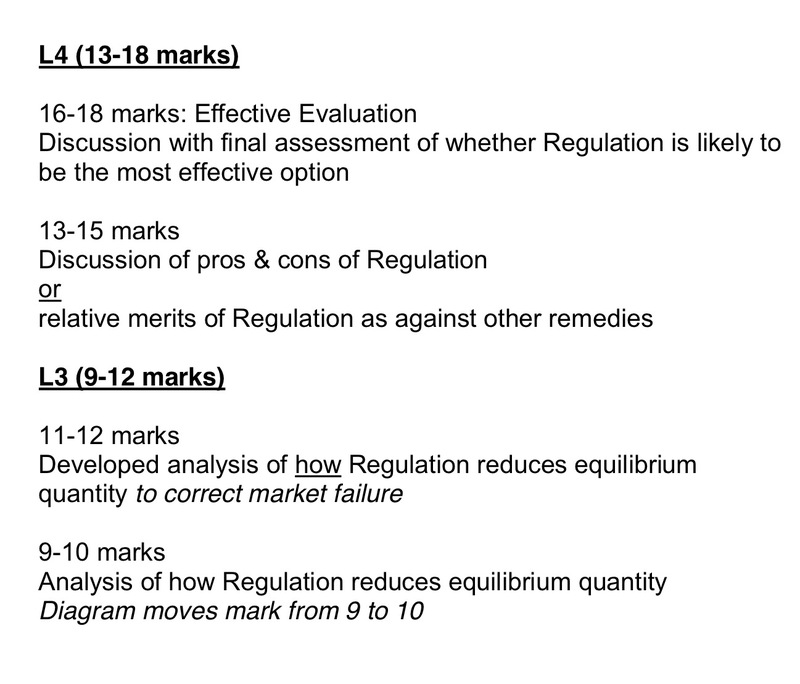 The lesson will be spread over two lessons; one to look at the structure of a mark scheme and the second to do the marking of sample scripts in more depth. Students will try to construct their own mark scheme prior to being given the official scheme, to establish the extent of their understanding of the topic before focusing on other students’ responses. We agreed to do another cycle of this in March when they next have a similar timed essay opportunity in Manna’s lessons. Jon and I will observe. Many thanks to the Y12s involved and to Jon and Manna for inviting me to join them. We reflected on the fact that I have observed both of them previously in a more formal SLT top-down style – and this was entirely different. When Jon was teaching, I felt he was teaching my lesson as much as his own and that changed the dynamics entirely. The emphasis was on the structure of the learning process we’d planned, not some notion of teacher performance. « Trivium 21st C: Could this be the answer? Has this approach been tried in MFL? Hi Laurence. Lesson study? Yes.. we have a group looking at the process in MFL. Thanks, Tom. Will you let me know how this goes, please? Great post Tom. We started lesson study last year and it has been enormously popular with out staff probably because it is not as you say the top down SLT lesson observation that tends to become an event or performance. We have now developed our lesson study trios where three staff from different subjects plan on a general theme with a focus on a particular group of students. Early days but again staff seem to like the collaborative aspect and the non judgement or grading. I think this is the way forward for the future ! Do you intend to feedback to other staff? I only ask because we have been ‘lesson studying’ for 2 years and I find this part fascinating; every teacher seems to take a slightly different slant on what they have learnt. Hi. Yes, absolutely. Once we’ve got a bit of experience, that’s that plan.